Personally, I find the biochemistry of photosynthesis fascinating, but I’m sure you think I’m crazy. Before I can dig into the details of the cutting edge research as to how photosynthesis can further be exploited for human food production and energy demands, I have to start with the basics. These posts will be cross-listed under ‘The Basics’ tab on the blog home page as a reference. If you already know all about these processes, skip to the bottom for the test*. Before even we start with photosynthesis, you have to know about a related process called cellular respiration. It is fundamentally a combustion reaction. In the same way your car burns gasoline to power your transportation, the overwhelming majority of life on earth is constantly repeating the cellular respiration reaction to provide energy to sustain life**. Glucose and oxygen are turned into carbon dioxide and water. This may make more sense to you since glucose and oxygen are things you know are essential to your life and carbon dioxide is something you exhale every minute of every day. Glucose: A simple sugar, a carbohydrate (aka carb), is a small but energy dense chemical that is the fundamental fuel source for life. Oxygen: A reactive gas needed for the combustion of fuel. Carbon dioxide: A gaseous by-product of combustion, a much simpler chemical than glucose. Water: An extremely stable usually liquid formed as a byproduct of combustion of fuel with oxygen. Your cells along with most of the rest of life on earth are burning the fuel glucose into useable biochemical energy. This energy-yielding reaction affords you the ability to walk, run, think, click to look at funny pictures of cats on the internet, whatever etc. I should also explicitly say that cellular respiration also occurs in photosynthetic organisms- they need to burn glucose for fuel too. Ultimately, the glucose you use comes from what you eat, which can be traced back to plants or some other organism that could perform photosynthesis. Carbon dioxide and water (and light) are turned into glucose and oxygen. You may notice that it is basically the reverse of the cellular respiration reaction. 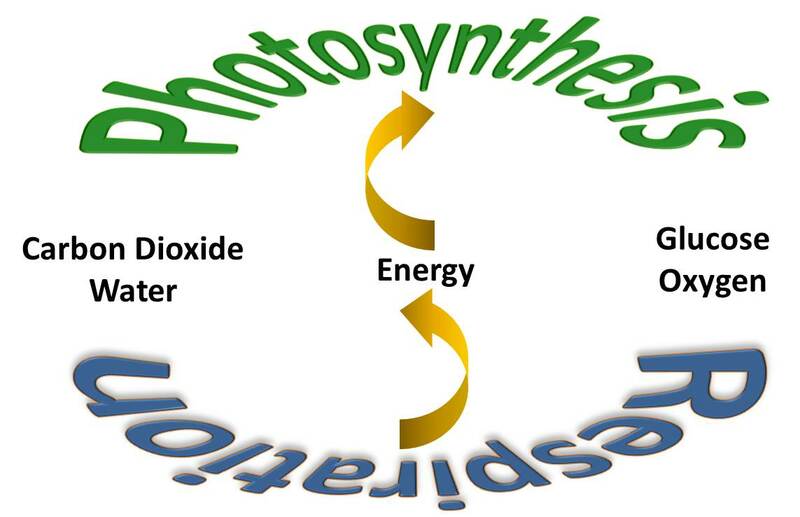 Photosynthesis takes the products of cellular respiration (carbon dioxide and water) and converts them into glucose while at the same time making oxygen. This is an energy-requiring reaction, and the energy used to accomplish this work comes in the form of light from the sun. Energetically-speaking, this is a great strategy because there is a huge amount of solar energy available. Also, here on earth, a.k.a. the blue planet, water is abundant. Plus, the way the chemical details shake out, using water as a reactant in the photosynthetic reactions also produces the fortunate product oxygen, which we all need anyway. Win! Altogether the complementary reactions of photosynthesis and cellular respiration keep life in business. Because of their fundamental role in biology, it makes sense that we should know more about how they work. That is why these reactions have been (and continue to be) the subject of basic scientific research. We still haven’t unraveled all their details, but there will be more to come here on this blog. *There’s not really a test. I wouldn’t have time to grade all three of you any way, but if you remembered this stuff from middle school, give yourself a gold star and send your science teacher(s) a thank-you e-mail for doing such a great job. Stay tuned for additional posts and eventually I will tell you something you don’t know. **Scientists loathe the terms always and never. Even when we can’t think of exceptions, we tend to be cautious. One thing we will say is that the diversity of biological forms never ceases to amaze us. In this case, there are organisms called chemotrophs that do not rely on photosynthesis at any level. Instead of using solar energy, these organisms rely on other inorganic energy sources like hydrogen sulfide, ferrous iron, etc. Clearly photosynthesis supports the bulk of life on earth, but there are some specialists that are completely independent. Don’t worry, these rugged individualists probably don’t care much one way or another about my preference for photosynthetic organisms. There are other scientists in the world passionate about them. Besides, they have been the subject of posts in other blogs. This entry was posted in basics, general science, photosynthesis and tagged Cellular respiration, Photosynthesis on June 26, 2013 by johnnaroose.